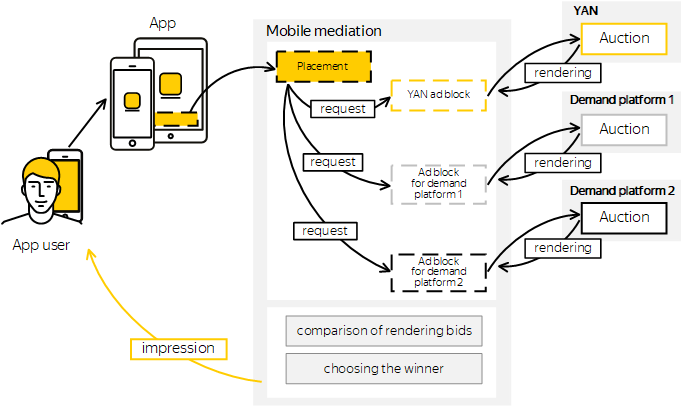 Mobile mediation is a platform that allows you to display ads from multiple demand platforms in a mobile app. Each demand platform will hold an auction for the right to show ads in your placement. The mobile mediation platform chooses the best offer from the auction winners. The more demand platforms are involved, the better the chances of filling the placement. The best offer is selected out of all the available offers. Connecting to international demand platforms allows you to show relevant ads to users from different areas. Each demand platform holds an auction and selects the ad that is best matched to the user. A rendering is a request for which an ad was successfully selected. Demand platforms pass their rendering bids to the mobile mediation platform. The platform compares these bids and chooses the winner. Your placement will show the ad block with the ad of the winning demand platform.